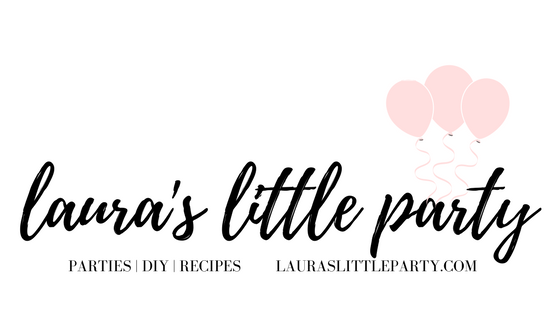 Back To School | Party Ideas + FREE printables! The back-to-school frenzy is here! 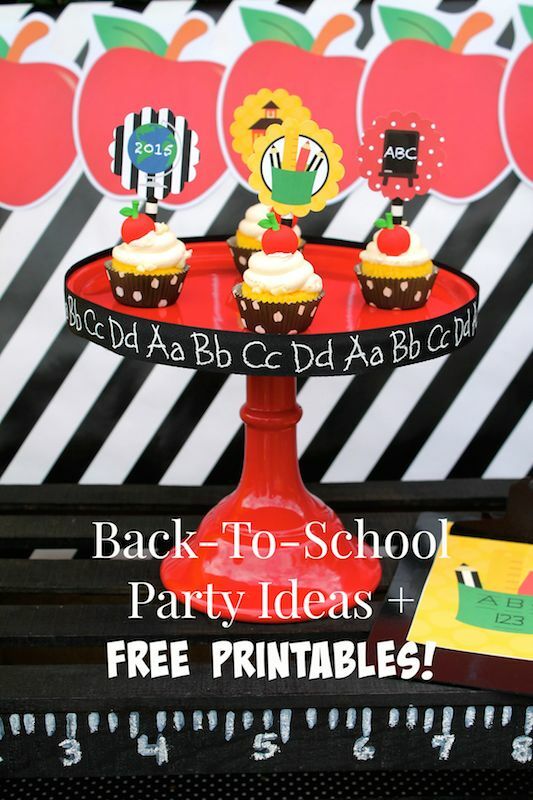 Whether or not your children are prepared for the new year, our back to school party ideas may soften the 'end of Summer' blow! I've got a little guy that is super excited to start Kindergarten this year! His Momma...? Not so much. But, sadness aside, I wanted to make the start to his first year in school, a memorable one! I planned a simple celebration, and now that I'm excited to join in with all the 'First day of school' photos, I created these photo signs. They're part of my FREE printable set. You'll find they go up to 6th grade. I included little cartons of milk, on our party table. I painted them, added some of my printables, and attached the straws with fun pencil clothespins that I found in the Target Dollar Spot. Are these flexible paper straws not the coolest?! Aardvark straws was kind enough to send some my way! Let me tell ya... they're awesome! Not only do they come in cool, festive colors, but they're ECO-FRIENDLY! We definitely need more of that. Be sure to check them out! Their selection is amazing. Thank you, Aardvark straws! I attached my colorful straw flags to paper straws, and displayed them inside one of my favorite painted Mason jars, from Just Add Glitter By Marla. 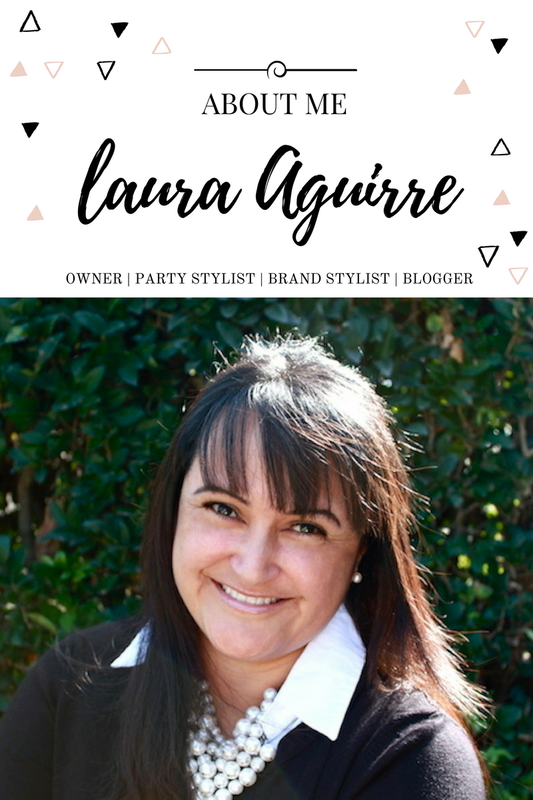 You will love her work! 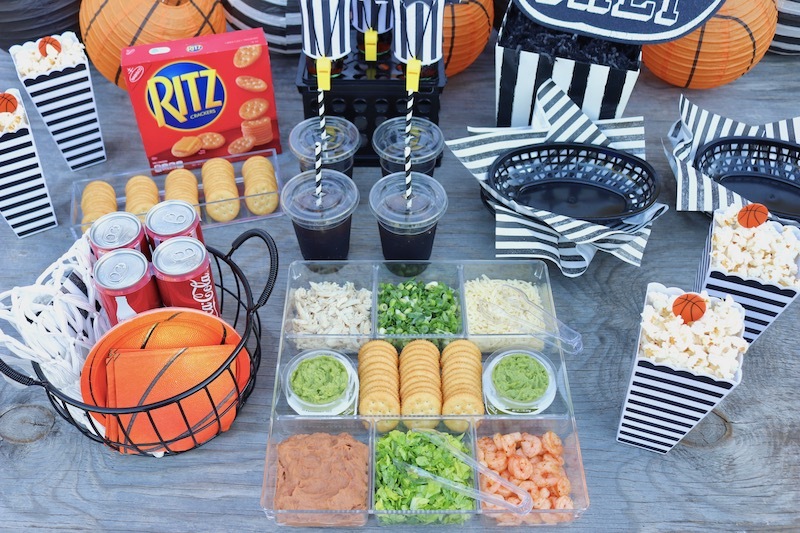 Our party table was simple, and best of all, no-fuss. I set out a few snacks, and sweet cupcakes. The apple slices, and popcorn cups were a big hit. To add a little decor to my cake stand, I attached some ruler ribbon around the edge. I couldn't pass it up for $1. Fun striped favor boxes were set out for the party guests. I added a little "something" to each box by attaching small packages of Crayola Pip-Squeaks, with alphabet ribbon, from Michael's. I created a friendly "Welcome" banner that you can download from our FREE printable set. I love using bright colors! The mini cupcakes were decorated with cupcake toppers, and small fondant apples, by Wilton. Eye-catching details will have your little guests excited! Even if it is for a "back-to-school" celebration. I love using my vintage bubble gum machine as party decor. I touched it up with Rustoleum 2x gloss black spray paint, and it looked brand new again! I've used my bubble gum machine for many of my parties. Here, I added scissors, crayons, glue, and mini notebooks inside. I added a school themed sign to a painted clipboard. If painted with chalk paint, you can even write a fun message to with your school-goers a great day! I love adding a little DIY to my party decor. My latest project was this painted wooden crate. 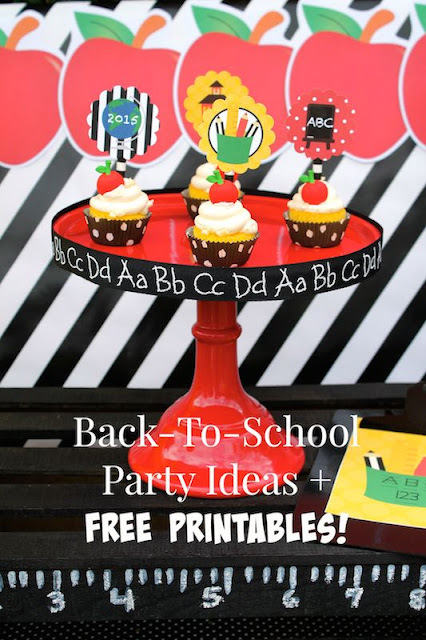 It was super easy to create, and added a fun element to my Back To School Party. Check out the link to my step-by-step DIY School Themed Wooden Crate! Be sure to get your free back-to-school printable set. Just let me know if there's a grade you'd like me to add. Enjoy! I hope you enjoyed seeing pictures of my Back-To-School Party. I can't believe that I'll have a sophmore, and a kindergartener this year! What grades are your children starting? What a fantastic party!! 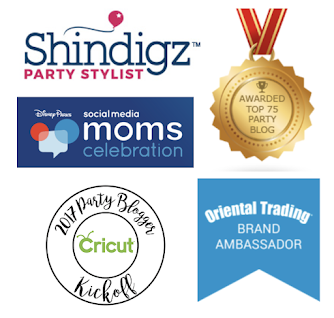 Love your printables, too! Such a darling party!! I love how you used black throughout because it made the primary colors just pop out at you. I don't see the link below. Is there one to download the printable set? Thank you. I love the set! great color, too!